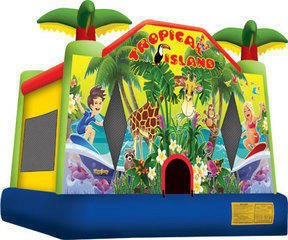 A tropical adventure awaits with this Tropical Island bounce house. Each visitor is greeted by plenty of colorful exotic animals, and even a pair of young surfers, as they take off for an afternoon of bouncing! Two three-dimensional palm trees balance this bright bounce house, perfect for attracting customers all day long.